More info:Single supplement from £1670 - £1910. Offers:Up to £580 off selected dates. Iceland’s wild west coast is the exciting destination for this small ship cruise; a place of dramatic scenery that’s often missed by visitors to this northern country. Spend eight days sailing from the capital Reykjavik on a yacht that sleeps between 30 and 50 passengers. You’ll see some of Iceland’s most beautiful landscapes, including the distinctive and much photographed Mount Kirkjufell, the waterfalls and extinct volcano on the Snaefellsnes Peninsula, and the picturesque port of Siglufjordur, Iceland’s northernmost city. There is wildlife to spot, too. Look out for puffins perched on the Westfjords coastline and scan the seas for whales, then soak up some of Iceland’s literary history in Pingeyri, where many of The Sagas were set. Cruising is a wonderful way to explore this dramatic and varied country, and we spend plenty of time on land, getting close to the mountains, glaciers, black sand beaches and waterfalls. Travelling on a small ship and being that much closer to the water, you can’t help but notice how plastic rubbish is collecting in our seas and oceans. To do our small part, we have worked to eradicate single use plastics on board our voyages. Responsible travel is one of the pillars our company is built upon. All of our travellers are provided with information regarding Responsible Travel at all stages of the booking process and while travelling with us. Our leaders are also trained extensively in Responsible Travel and will advocate for this throughout our trips. Travelling by small ship has a much lower impact on the environment and specifically, on the towns and rural areas that we visit. Iceland is experiencing a tourism boom and for such a small country with small roads connecting rural areas, by staying off these roads (except for a few excursions which involve some travel by coach), we are not impacting the local communities and countryside in the same way that large scale coach touring may. Compared to large ship, all-inclusive touring, small ship cruising gives many more opportunities for our clients’ money to be spent in local communities. We don’t include all meals so there will be opportunities on most days for passengers to experience local cuisine and dine in local establishments. Our leaders are local so will be able to make recommendations spreading the business around in any town we visit at meal times. In Iceland, as we are embarking and disembarking for shore activities in small coastal communities who are not necessarily on the more common tourist trail, we have the opportunity to spread those tourist krona around. On this trip in Iceland, we will visit a couple of cultural attractions in places outside of Reykjavik that may not always see a large number of visitors. 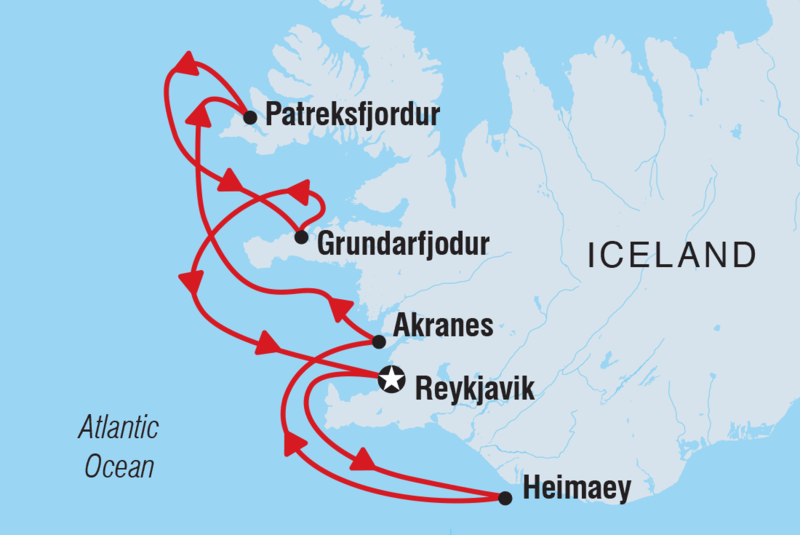 We will visit the Viking Centre at Pyngeyri to better understand the origins of the Icelandic people and the Herring Centre in Siglufjordu to learn how the herring industry shaped the economy of Iceland during the mid 20th century. We have recently started a Destination Management Company in Iceland to manage our touring operations in the country. The DMC will employ local people and will allow us to ensure that our responsible tourism standards and philosophy is upheld in Iceland. The company is following the International Labour Organisation (ILO) guidelines and fully Maritime Labour Convention (MLC) compliant whereas the rights of the seafarers are safeguarded. There is no discrimination on the gender of the seafarers and best candidate is being employed in each position.